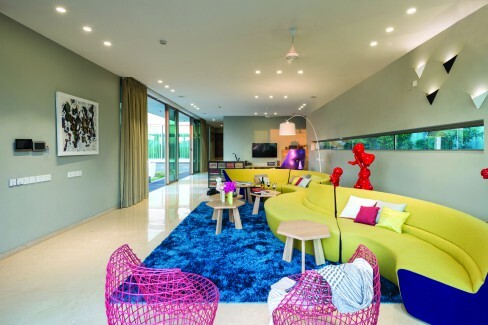 Mumbai-based design firm, Design Inc has refurbished a home in Lonavala making it a veritable treasure trove of happy memories. The living room blends in easily with the dining area from this angle. However, when you move from one room to the other, you realise there is a marked difference in the styles and narratives presented in these spaces. Founded in the year 2000, Design Inc is a Mumbai based firm that specialises in architecture, interior design as well as landscape design. Spearheaded by architects Kunal Khandelwal and Khushboo Sanghavi, the design practice’s latest marvel is a villa in Lonavala that was completed in 2016. Home Review takes you on an in-depth tour of the property that will be used as ‘a second home’ by the clients. “We translated the simple brief to create a space which epitomises the idea of having fun,” say Khushboo and Kunal as they expound on the clients’ initial brief – ‘a space where in one forgets all their troubles and engages in the simple pleasures of life’ – a second home in the outskirts of the city where one can escape from the daily humdrum of life. The primary layout of the villa supported a living room with multiple seating, a dining area, a private den in the basement, bedrooms situated at different levels, along with a swimming pool and a landscaped garden replete with a pergola space. There was also a terrace deck ideal for parties and the occasional intimate evening under the stars. 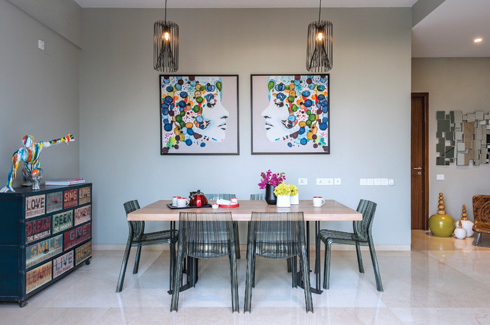 One of our favourite spaces in the villa, the dining area is an interesting mélange of art, colour, texture and design. The team at Design Inc, that included Khushboo, Kunal and designer Tejal Gada, was keen on creating a story within each space of the house by specifically highlighting certain elements particular to the space, namely in the form of an accessory or a piece of furniture. 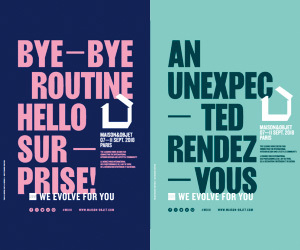 This insistence to maintain the original structure and highlight existing accessories within the layout is reflective of Design Inc’s creative and pragmatic approach to design. A series of laughing red statues form the backdrop to an amoeboid sofa that takes up prominence in the living room area. The statues when paired with a set of face paintings framed by wireframe light fixtures in the dining area make the entire space a rather eclectic one, doing away with the otherwise formal living and dining area settings of traditional homes. 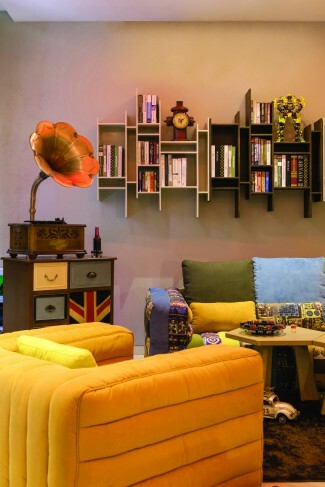 The basement boasts of a private den that is accentuated by a multi-coloured quilted sofa that is set against a heavily stacked bookcase. 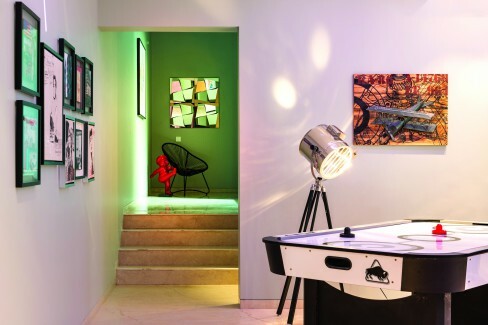 The den is pumped with colours and works of art that are not only eclectic in orientation, but also do their bit in terms of setting up the ambience for a round of air-hockey. Colour-changing light fixtures that run through the ceiling set the tone for the den, turning it into a cosy nook, rather than a stuffy old work-space. However, our favourite feature in the villa is the omnipresent ceramic black and white bulldog – placed at various spots throughout the interiors. The pool and the landscape are positioned around a conspicuous red statue that jumps into the water, with a coloured horse under the pergola, happily grazing on the grass. This adds to the overall lazy and relaxed vibe that is a steady feature throughout the villa. 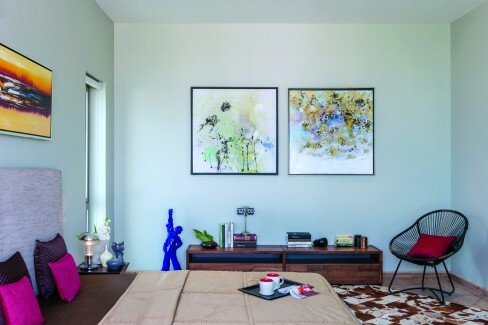 Much like the living and dining areas, the bedrooms and bath areas come with their own dramatic narrative that is augmented by eclectic furnishings and pieces of furniture, the latter having been sourced from Defurn, in Mumbai. Cry while watching a movie. Live. Explore. Dream. Laugh. Love. Play. Dream. Every single addition and detailing to the villa is based on the principle that runs through this simple poem – a life that is clean, inviting as well as has its own measure of fun on the side. At the heart of Design Inc’s philosophy is the belief that ‘a good design can change one’s life as well as one’s way of thinking.’ And this philosophy comes to life with the villa in Lonavala, with each piece and every single space within the house telling a story that is meant to be a conversation starter of sorts – all of which translates into the clients’ primary requirement of wanting a second home.